According to the latest report from the International Energy Agency (IEA), solar energy could be a major source of world electricity in 2050, surpassing nuclear, fossil fuel, wind, etc. In the roadmaps published by the IEA is expected to reach solar PV 16% of total electricity generation and solar thermal energy by 11% between both getting reduced CO2 emissions equivalent to the entire sector transport of the world today. One of the main reasons is the increasing cost reduction of photovoltaic solar modules, together with the modularity and quick installation of such systems is enabling a significant increase in installations worldwide. The document shows that the boom will star photovoltaic until about 2030, when the growth of photovoltaics will stagnate to reach nearby quota to 15%, due to regulation impossibility of this technology to accommodate the power demand of each moment (production is proportional to the sun at all times received). That's when the solar thermal technology found its greatest share growth through their adaptability to consumption, thus complementing with photovoltaics. 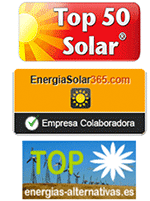 PV is based on the direct conversion of light into electricity through photovoltaic panels. The existence of cheap solar panels is and will be primarily responsible for the expansion of this technology. Instead, solar thermal technology is based on the concentration of sunlight for heating a fluid raising its enough for the use in a conventional thermal cycle (steam turbine) temperature. Such heating can be stored allowing regulate production to generate electricity in peak hours and even at night. The growth of renewable energy is already causing stagnation of conventional generation systems such as nuclear. Contrary to what many analysts had predicted and advocates of nuclear power, it not only has there been no growth but its contribution to the global energy mix continues to fall. And the prophesied second youth of atomic energy does not stop coming. As confirmed by the data provided by the International Atomic Energy Agency, the global nuclear power operation was -1% in the last three years. This stagnation of nuclear power is due, among other reasons, the social fear caused by disasters like Fukushima, the problem is not resolved by the accumulation of nuclear waste or economic uncertainty. In addition, of course, the emergence of real alternatives thanks to the boom and subsequent lowering of renewable energy.